1) Kyrgios goes up a set and a break. 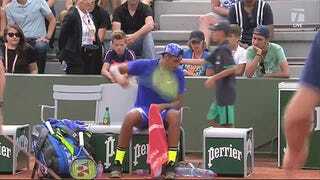 2) The opponent storms back to get their own set point on Kyrgios’s serve. 3) Kyrgios double-faults on an overzealous second serve. If you’re a Kyrgios fan, after step three is the time to just turn the match off. Nothing good will follow. That’s what happened last week in Lyon, when he ceded a huge lead to the world No. 96 Nicolas Kicker, and today the 18-seed repeated the same exact pattern at the French Open, marking his second-straight flameout in the second round of a Grand Slam. Despite going down a set and 4-2, the unseeded Kevin Anderson—playing some sharp tennis, to be fair, but not sharp enough to fully explain a scoreline like this—rebounded to win 5-7, 6-4, 6-1, 6-2. The Australian cruised through the third set in full-tank mode, getting broken twice and winning just 15 points to Anderson’s 30, to deliver it 6-1. But if you thought that the additional breathing room of a best-of-five format might have provided more time to resettle his mind and regain some focus, you, like me, were deluded. Kyrgios had his chances in the fourth set, and they were tantalizing, juicy ones: in two separate return games, he went up 0-40. Both times he failed to convert. For his part, Anderson had settled deeply into his serving groove by that stage of the match: he won 93 percent of his first-serve points in the third set, and 90 percent in the fourth. Overall, he served 21 aces to Kyrgios’s 19—rare for Nick to lose out on that statistic—and won a commanding 86 percent of his first-serve points, in what ended up looking more like a breezy rout with a weird first set glued onto the front end. And he did play pretty well. When he feels like running, he can do a lot of damage on clay, with his live-wire groundstrokes and feinted touch shots, as we were reminded in his first-round win. Today brought more of the usual Kyrgios highlights. By now they are familiar. There were aces fast enough to defy the eye; there were backhand winners blocked down the line with an abbreviated swing; there were untouchable inside-out forehands leaping off the court. But again, for the second major tournament in a row, these were swamped out by all the lowlights.